Hi there everyone! My name is Samantha and I blog over at PlanetBakeLife. Today I’ve very kindly been asked to do a guest post exchange with Chelsea and I’m super excited because you can find one of her recipes on my blog too. That’s a blogship right there people. So if you don’t know me then in a nutshell, I’m a Saffa that lives in New Zealand via the UK and my one true passion is bread. But today I’m not going to do bread for you, I’m going to do a breakfast tart that will get all your friends and family drooling down their chins and begging for the recipe. It’s super simple to make and you can use these as well as or instead of eggs, it’s up to you! It’s also super flexible so you can change it up for different occasions and they can be served hot or cold. It’s the holy grail of breakfast really. 1// Pop your salt, flour, water and oil in a bowl and mix together with a spoon. When it starts to clump together, turn onto a floured surface and very lightly knead together into a ball for a minute. 2// Roll out the dough. You want it to be very thin, the thinner the better! If you can see the surface through the dough then that’s amazing. If you want it a little thicker then that’s ok too. 3// Use a side plate or a cookie cutter to cut out circles. You will need to choose something that is a good size for the tin you’re going to use. I used a standard size 12 hole cupcake tin but you can use Texas muffin tins as well. 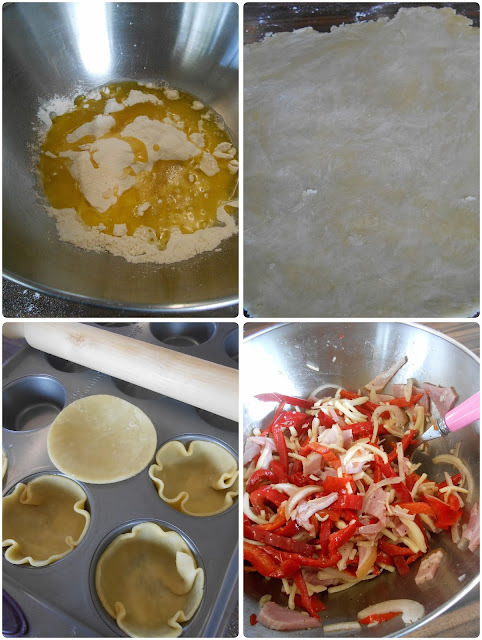 4// Place the pastry inside the holes of the tin, poke lightly with a fork a couple of times and pop into a preheated oven of 200 degrees C for 5 minutes. 1// Chop the bacon, onion and peppers into small pieces. Add salt and pepper and the cheese and mix together. *Note: I use tinned peppers that come stripped in olive oil which helps to bind the mixture. The cheese I use is a pre-grated Mozzerella and Cheddar mix but you can choose any cheese that you really love. 2// Pop the mixture into the blind baked shells and then back into the oven for 15 minutes. 3// At this point you can either serve the tarts with eggs on the side or you can crack an egg onto the top of the tarts and return to the oven for 10 minutes or longer depending on how you like your egg cooked. That’s it! It’s a really simple recipe and you can serve these with a dollop of sour cream, a spicy tomato relish or a cucumber and chive dip. I hope you like these and pop over to have a look at Chelsea’s recipe on my blog too! If you enjoy Samantha's beautiful recipes like I do check her out at Planet Bake Life! You can also find her on Twitter , Facebook, Bloglovin', and Pinterest!